I absolutely love late summer and early fall – the air is cooler, apples, blackberries and garden veggies are ripe, and the local wildlife is out and about. This morning, a doe, two fawns and a spike mozzied through my yard and snacked on the moss on a branch that fell out of a tree. Then the neighborhood peacock hen came through–not sure where that one came from, but she’s pretty. Growing a vegetable garden is a healthy hobby, but I never thought of it as entertaining until now. 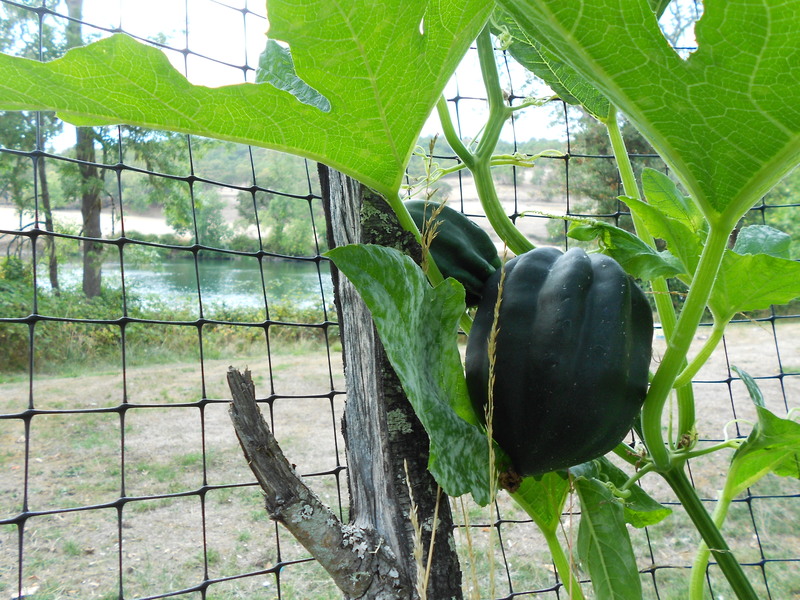 This year’s garden grew like crazy so I have little watermelons hanging out of the bush beans, butternut squash growing throughout the entire space including the strawberries, and both the butternut and acorn squash climbing the fences. Can you believe this crazy squash? I didn’t expect it to make it to maturity without falling off the vine, but I picked and cooked it last night. 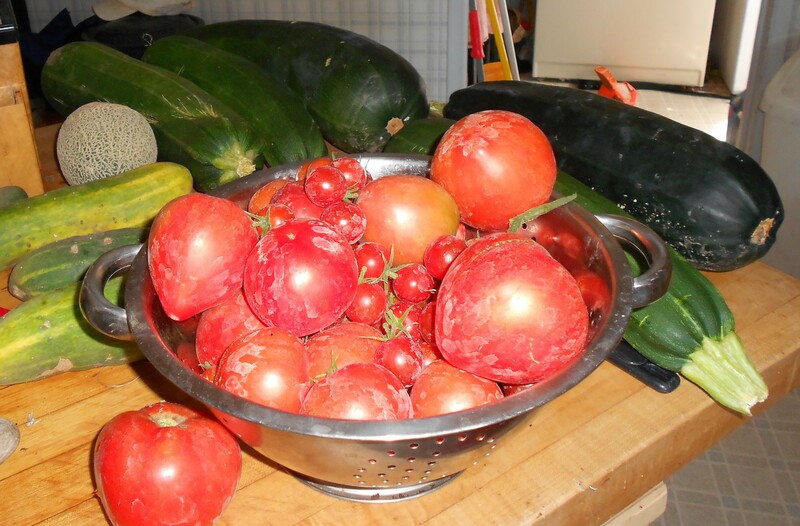 There’s squash, tomatoes, zucchini, melon and peppers taking over my kitchen counters. I’m not complaining – I’ve been eating fresh vegetables every day. I’m hooked on baked tomatoes right now. Of course I like them fresh too, and I also started baking them sprinkled with Parmesan cheese. 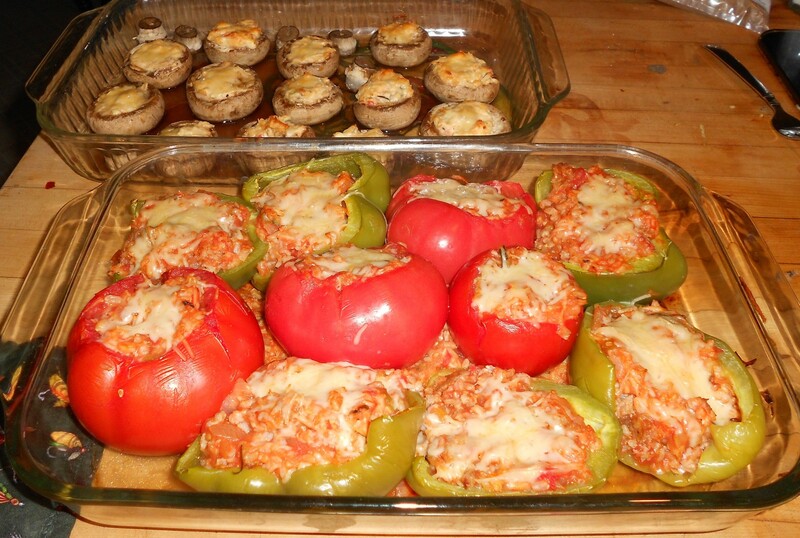 These are stuffed tomatoes, green peppers and mushrooms that I made for dinner. I am wondering what else I can make with zucchini besides grilled zucchini, bread, stuffed zucchini and spaghetti sauce, but it’s still been fun. I wonder if you can carve giant zucchinis for Halloween??? I wasn’t sure if moseyed was even a real word, so I made up a spelling! Funny. You apparently were not raised by a person who was raised by a southern person (follow that?). Moseying is something we do while shopping or other strolling type activities. However, I don’t “fix.” Like… “I’m fixin’ to go to the hardware store.” No.. I don’t do that. Meanwhile, love the vine on the fence. Gotta try that with cucumbers next year!